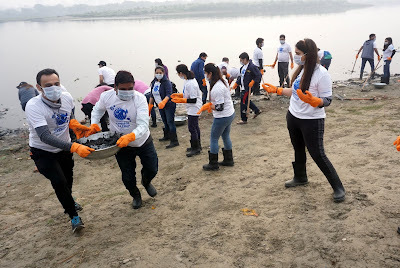 Reiterating its commitment of giving back to the community and protecting the environment, more than 500 American Express India employees participated in a coastal and river cleanup drive across three cities Delhi, Mumbai and Chennai today. The initiative is a part of American Express’ global corporate social responsibility program in association with Ocean Conservancy, an international non-profit organisation working to protect oceans from today’s greatest global challenges. Besides India, American Express employees globally have participated in five coastal cleanup events removing trash from local waterways, beaches, lakes and rivers in the U.S.A, Italy, Malaysia and Australia till date. Ocean Conservancy’s International Coastal Cleanup has assembled nearly 13 million volunteers and diverted 250 million pounds of trash from oceans globally. An estimated 8 million metric tons of plastic waste flows into the ocean annually, causing harm to wildlife, polluting beaches, and even permeating food from the ocean. Scientists predict that without concerted global action, there could be one ton of plastic for every three tons of fin fish in the ocean by 2025. The Ocean Conservancy programs are organized with an aim to protect the waterways and wildlife from the hazardous effects of pollution.